I can’t believe Christmas is 3 days away and I have not done any baking. This is very unusual for me and not because I haven’t wanted to or haven’t been prepared. I have sprinkles galore, I have sugar, flour, molasses (for THE best gingerbread cookies ever), and cute cookie cutters. I also have a dissertation timeline that is a bit tight and since I set my final defense date (wow to see that in writing is exciting but also scary) there is no turning back. I was only going to give myself Christmas day off, but as it approached I became a bit sad. We already had decided to stay home for Christmas due to my tight deadline and now I was denying myself the joy of baking? It is a tradition to bake cookies, rum cake, and other goodies and I would be denying myself of this joy. So last Friday I ordered some fun decorating sugar and decided I would treat myself to a day of baking on the 24th. Baking is my therapy and I especially love it during the holidays because I turn up the Christmas music and get lost in baking. Now the next two days will be difficult because my sparkly sugar arrived and all I want to do now is bake. Looking at data and revising a manuscript seem much less exciting than decorating sugar cookies. 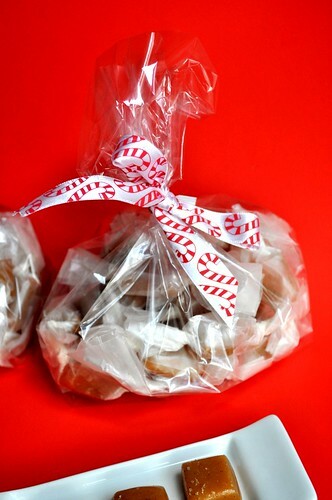 I did take some time this past weekend to make these caramels. 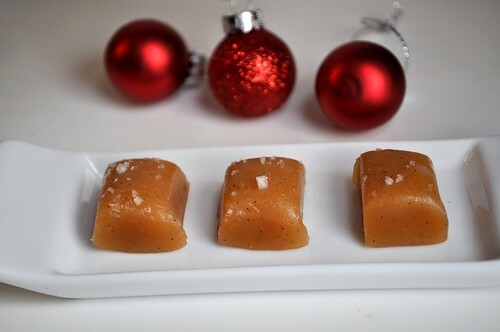 They were a huge hit, I just wish I had made more 🙂 I used fleur de sel I bought in Paris this summer, but you can find it online, possibly at your grocery store, or at places like Williams Sonoma. You may be able to use regular sea salt in the grocery store, although it tends to be a bit larger grain. 1. Line the bottom of an 8-inch square pan with parchment paper, coat parchment paper lightly with butter. 2. Split vanilla bean pod in half lengthwise, and scrape out the seeds (keep both). 3. In a small saucepan, mix butter, cream, vanilla, vanilla pod, vanilla beans, and fleur de sel. Bring to a boil, remove from heat, and set aside. 4. Boil sugar, syrup, and water in a 3-4 quart heavy pan. Stir, until the sugar has dissolved. Boil mixture but do not stir once boiling, gently swirl pan. Continue to boil until the mixture is a light golden caramel color. 5. Remove the vanilla bean pod halves and very carefully add cream mixture to the sugar mixture (the mixture will bubble so be careful). Stir frequently, until the mixture reaches 248F on a kitchen thermometer. 6. Pour the mixture into the prepared 8-inch pan and let cool for 30 minutes. 7. After cooled for 30 minutes, sprinkle fleur de sel on top. Let cool completely. 8. Using a buttered pizza cutter, cut into 1-inch pieces. 9. Wrap using 3-inch squares of wax paper and twisting the ends together. Makes about 64 1-inch caramels.